You can’t go wrong making Old Faithful your first stop at Yellowstone. 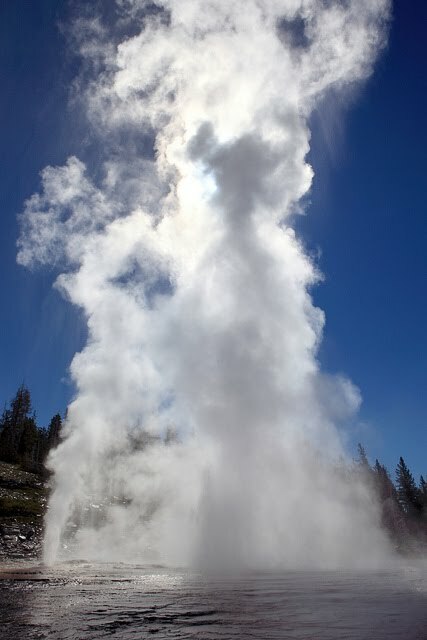 Given that you’re obligated by federal law to see the famous geyser at some point, you might as well get it out of the way early. Our timing was pretty good – it went off very soon after we arrived, and we beat the big crowds by getting there early. After dutifully photographing Old Faithful, we hiked out to some of the other nearby thermal areas and noticed a lot of people gathered at Grand Geyser. 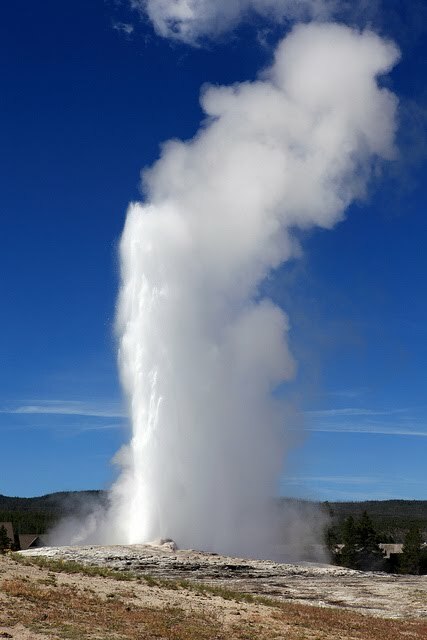 It was about 10:00 in the morning and a sign on the boardwalk said the geyser, which isn’t as predictable as Old Faithful, would probably go off between 8:00 and 10:30. We almost decided to leave, not knowing anything about this particular geyser and wanting to be back for the next eruption of Old Faithful, but we ended up deciding to stay. Good decision. After only a few minutes, Grand Geyser went off and made Old Faithful look like the spray from a garden hose. Not only was Grand Geyser much bigger, with a few different streams contributing, but the eruption lasted at least 10 minutes, many times longer than Old Faithful. What luck to stumble on that thing at just the right time. Apparently it’s the tallest predictable geyser in the world. Who knew? You can accuse me of many things, but you’d have a weak case if you tried to accuse me of neglecting geysers this year. Within the past few months, I’ve seen arguably the most famous geyser (Old Faithful), the tallest geyser (Grand Geyser), and the original geyser that gave its name to all the others (Geysir, in Iceland). After walking around the Old Faithful area, Marie and I drove to the Grand Prismatic Spring. 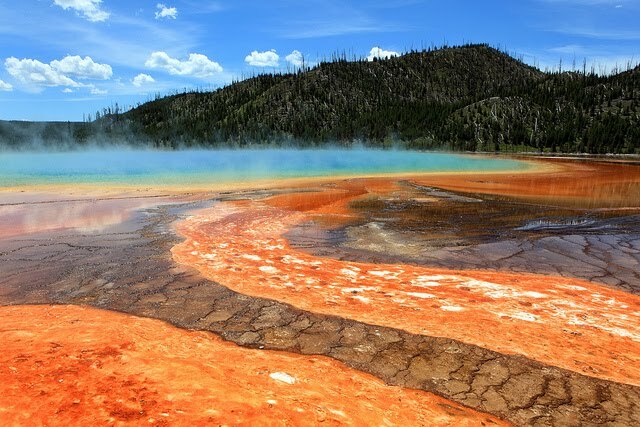 Anything called “Grand Prismatic Spring” had better be pretty cool, and it is. The best view of the spring, though, is from directly above it, but – lacking a helicopter and/or a hover-capable jet pack – we were limited to the normal side view. 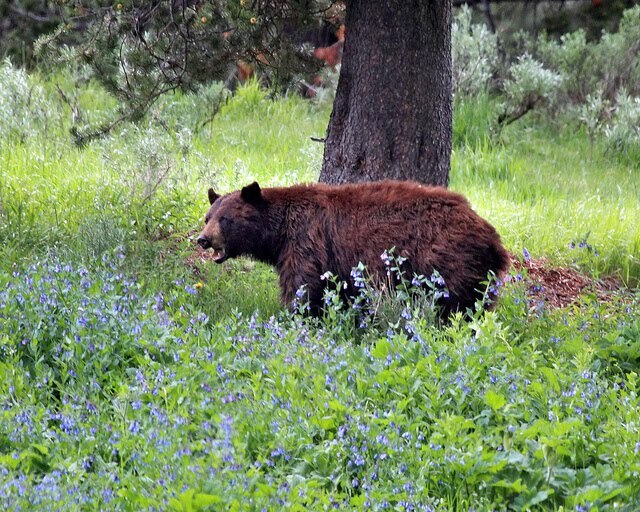 Not far from the Grand Prismatic Spring we had our first bear sighting. A crowd had gathered on the road to gawk at what the park ranger on the scene described as a “cinnamon black bear.” It was pretty far away and even with my 100-400mm lens I wasn’t able to get much of a shot. 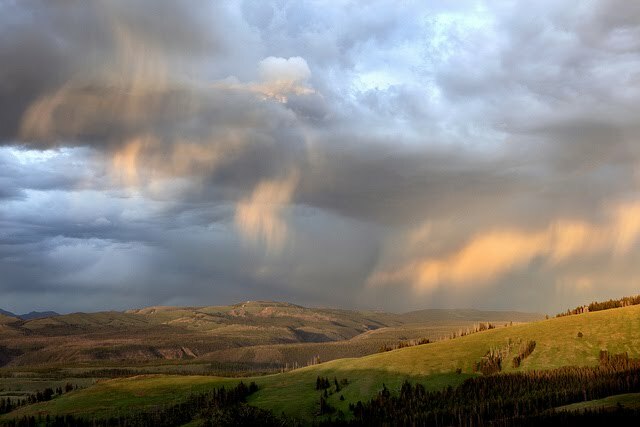 Our next order of business was to set up our tent at the Canyon Village campground (and inevitably take a short nap), followed by a scouting expedition to nearby Yellowstone Falls. I wanted to take photos there at sunrise the next morning and needed to make sure I knew how to find Artist’s Point well enough that I could do it even when my brain was only one-quarter awake. Back at Canyon Village we had a quick dinner and then – noticing some interesting clouds as sunset approached – we drove north looking for something to photograph. Unlike the past two mornings, the sky was bringing its ‘A’ game – all kinds of great clouds, scattered rain showers making interesting patterns, lots of different kinds of color… We were caught on the wrong side of a mountain when the most intense color appeared in the west but still managed to get some decent shots. One more big event awaited us back at Canyon Village. Marie hadn’t been camping since she was a kid and even then she somehow missed out on one of camping’s most hallowed rituals: the making of s’mores. Better late than never… We built a fire, whittled a stick, busted out the marshmallows, chocolate, and graham crackers, and did it up right. 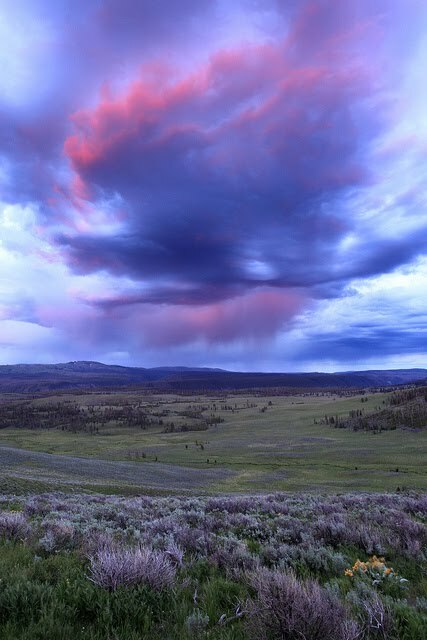 All things considered, not a bad first day in Yellowstone. Hey Rob! That bear picture is impressive! I have no idea what you're talking about! Lol! I'm glad the clouds finally showed up in full force for you guys! And that you gave Marie the full camping experience with S'Mores! 🙂 Good job, young grasshopper! Can't wait.. It will be the highlight of your trip, next to visiting Susan's newest addition to the family: a cream-colored hamster “the size of her foot” according to Susan… Good luck.